In the tracks of Che on the carefree highway. Well refreshed after a good nights sleep and business like breakfast we pulled out of the excellent and very modern Pullman hotel complex this morning under bright blue skies, and for the meteorologists back at home, there was no wind this morning. We had stayed in Rosario for somewhat less time than its most famous son, Ernesto Che Guevara who lived here briefly as a baby in 1928; but our connection with him continued throughout the day. As a sickly child with severe asthma his doctors recommended to his parents that they move to a drier climate such as that found in Alta Gracia, which was on today's Rally route. Rosario's second most famous son is the footballer Lionel Messi who was also born and bred here and it was also the birthplace of the Argentinian flag as well as being an important port on the Rio Parana. Ahead of us lay 460km via Alta Gracia, a town founded by the Jesuits in the 17th Century, to Cordoba. A long way indeed but with Endurance Rallying that's the name of the game. The Ford Model A of Ross Lilleker and David Cooley, car 11, AKA Evita got an early start and we found them gallantly trucking on up the highway in good order an hour ahead of the rest of the a rally on another excellent two lane highway. We're gradually getting a sense of just how big this country is but it's springtime, it's warm and sunny and it doesn't get much better than this. Wind pumps (not as busy as they would have been yesterday), grain stores, toll booths and police checkpoints marked our progress. Despite giving the impression of being a pancake flat drive we gradually left the low lying pampas behind us and gained height slowly all day, from less than 100m at the start to around than 600m by the time we finished and it was one of those days where there were no turnings for 340km or more. By the time we reached the Passage Control some crews had forgotten what the steering wheel was for and a with little else to see over the endless horizon our eye was drawn to a brand spanking new Claas combine harvester depot, German and Argentinian flags standing side by side. A potent symbol of two countries united in mechanised agriculture. After 368km it was a relief to get to the PC in Rosegundo, a chance to fill the tank, stretch the legs and enjoy a coffee. The 80km to the hotel following this included a few turns and roundabouts and was time enough for the drivers to reacquaint themselves with their steering wheels. Today was also a test of range, fuel was "well spaced" and there was more than one crew who arrived at the PC sucking on vapour. We glimpsed the Sierra des San Luis mountains in which Cordoba sits through the heat haze and we were given a hint of the landscape of the tail end of the Andes which is going to become our constant companion for the next few days. We arrived at the excellent Alta Gracia circuit as a round of the Argentinian touring Car Championship was taking place. We had been given the option to drive the circuit once the track cars had finished so we amused ourselves on the field next door by watching a few chukkas of pato. A game closely related to polo which involves horsepower of a totally different nature, we found it fascinating and came over all Jilly Cooper. The hospitable crowd even offered us food and drink at half time as their mounts relaxed in whatever shade they could find. 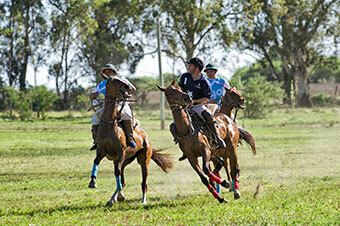 Ever the keen participant, polo regular Hugo Upton blagged his way onto a pony and onto the subs bench. Sadly he wasn't needed. From the service department we can report that Alastair Caldwell did indeed start this morning, after replacing the head gasket on his Mercedes in Rosario last night. He made good progress to Cordoba so let's hope that his troubles of yesterday are behind him. Some more good news to report is that Michael Maedel and Roy Haddad rejoined us today. The Jaguar is fixed and after their inauspicious start the crew are looking forward to the rest of the Rally. 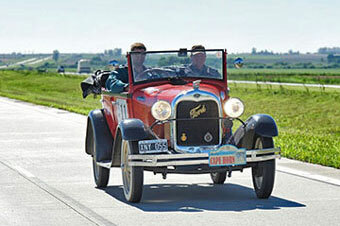 Udo Bichler and Antony Edwards in the 1939 Buick Coupe are also back with us. Their radiator leak is fixed but may need further attention along the route. Really disappointing news though came from Francis Galashan and Michael Brooks. 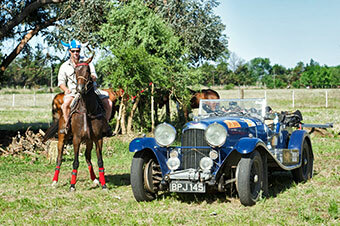 Their 1938 Alvis has a problem with the cam chain tensioner and can only limp along. They've taken the decision to leave the rally here, sort out shipping the car home and catch us up in a hire car as soon as possible. We wish them good luck. With no competition today then there's no change to the Caldwell / Williams leaderboard.